"An exceptional record of the experiences of British forces from the fall of Singapore"
To mark the 65th anniversay of the Fall of Singapore Souvenir Press are re-issuing one of the great books of our time, a remarkable record of the war in the Far East and a memorial to all who served there. 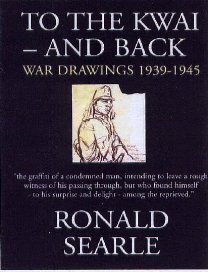 Ronald Searle's 'To the Kwai - and Back' faithfully reproduces in full colour the hundreds of sketches Searle made as a prisoner on the Burma Railway and in Changi prison. Published in hardback, sized 11½ x 8¾ inches this is a book that will be kept and prized forever, a book to be handed down between generations as an act of remembrance of the suffering and courage shown by those in your family who served their country in the Far East. Sapper Ronald Searle drew his fellow prisoners, their Japanese guards and the places and people he glimpsed outside the prison fences making this a fitting memorial to those who fought in the Far East. Souvenir Press are proud to offer copies of Ronald Searle's 'To the Kwai -and Back' for £25.00 with free postage and packing (worth £5.00) for all supporters of COFEPOW and for each copy sold will donate £2.50 to COFEPOW's work. Please mention the COFEPOW web site when ordering.